All the mentioned workshops and the summer training & internship programs can be organized in your Institution/Organization. If you are interested, please notify at events@bonfring.org or call us at (+91) 422 3928700 | (+91) 82200 15234 with your complete contact details along with the details of your Institution/Organization. 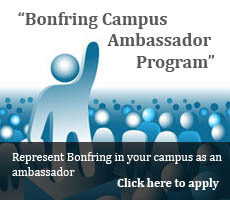 After the request is submitted to bonfring, representatives of bonfring will contact you for further assistance.